Captain Morgan’s newly launched campaign to get millennials to run for President is not being received well by Twitter users, with many asking the rum company, "Are you drunk?" The company launched its #UNDER35POTUS campaign on Tuesday with a full-page ad in the New York Times, a social media campaign, and a White House petition to lower the age to become President, which is currently 35. The petition has garnered slightly more than 1,000 signatures since it was started on Monday. It has a month to get the required 100,000 signatures to warrant a response from the White House. Captain Morgan is working with Taylor Strategy on the campaign, which runs through Election Day on Nov. 8. Taylor helped produce a video to prove the capability of under 35-year-olds that included several prominent members of the tech world and their achievements. Jim Sias, director of influencer, advocacy and integrated communications for Morgan parent Diageo, explained that the brand has launched this campaign to engage Millennials in politics. "We believe that having more people engaged in the democratic process is ultimately a good thing," Sias said. "As a brand that’s never shied away from activating in culture, we saw this as an opportunity to enable a generation of voices to be heard on a national stage in a fun way that’s true to our brand." 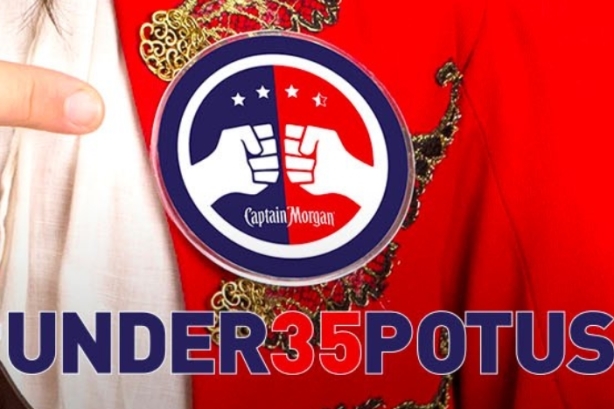 In response to the negative comments the campaign has received, Sias said that even though there are those who are unsupportive, Captain Morgan is still creating a conversation, which is a good thing. "People are very passionate about politics and we always knew there would be differing opinions on both sides," said Sias. "When people understand the context and that our goal is more than changing the Constitution, we’ve seen more support." @CaptainMorganUS Go home. You're drunk. @CaptainMorganUS I'm under 35 and I'm also completely against this idea. One user accused the company of trolling its customers. @CaptainMorganUS this is literally the dumbest thing I have seen. But you knew it was dumb. Advertrolling. Some went so far to say that Captain Morgan lost their business because of the campaign. @CaptainMorganUS Elect a leader with few life experiences? Not just crazy, it's a dangerous idea. You've lost me as a customer.